Thank goodness! PR and Social Media without the Spin! A simple read with a simple message. And this is why this book is as clever as its author, Catriona Pollard. If you're in the business of building your reach, then you'll appreciate the tips and step-by-step introduction to building your profile or growing your business' reach via Facebook and LinkedIn. Pages 130-145 are a must-read. Thanks for making sense in your new book, Catriona. A must read book for Small Business Owners. This really opened my eyes to the world of 'PR'. I love the action steps provided through each chapter as bonus sections of this book and have been following it like a script. I wish Catriona all the best with this book and hope it gets to Best Seller status. Definitely a must read for any small business owner who is trying to understand how to market their business. Could seriously be considered a handbook - there's so much great info in here! OMG so much great (and relevant) information! So many books tease you with the promise of great information but end up being light on specifics. This book by Catriona Pollard is the total opposite! There is SO much useful information in this book, it could seriously be thought of as a handbook for anyone wanting to figure out how to go from obscurity to being known as a well-respected expert. Not only does she tell you WHAT to do, but she gives you actual examples and step by step checklists showing you HOW to do it. And it covers a bunch of areas from blogging and getting speaking gigs, to how to pitch your story to a journalist, position your personal brand and finally get social media working FOR you (rather than the other way around). Love it! Just a quick note to say thank you! I am reading through your documents from the Unknown to Expert pack and it's fantastic! I'm sitting here studiously sending out my speakers profile and letter. It was so great to use your templates to get the process started this year in 2015. My documents are looking more professional than ever. Great stuff! Good book to read if you are building your platform. Surprisingly pretty good collection of what you will find free on the blog and videos. However, it's worth it to have it compiled in one location. If you've already read and seen all her vids, then its going to look and feel like a refresher course. It is written like an eBook, large print and few sentences per page = quick read. Keeping all that in mind, it is well worth the price. I am loving Unknown To Expert and I am only 3 chapters in (1/2 way through). My fav chapter so far is figuring out the WHY! It has always been about that for me but I feel like I have had some aha moments with Catriona's book. I am just getting started to position myself as an expert in my area and I love the tip that was given about exploring your motivation. The message I took for that section was about really knowing who you are, what you stand for and being congruent with your message. Nice one Catriona! The next segment is Setting The Stage... pumped! Great read on PR and gaining new perspective on this topic. Only read through few chapters of Catriona's book so far and love her style of writing as it seems like having a conversation with her in person! Great to learn how PR fits into many aspects of business and ways to continuously improve in it. Catriona - my book arrived last week and I am honestly blown away by its content, I really can see that this will be my well thumbed bible for many years to come! Congratulations on producing the most useful book in my business library! Positive and empowering language. 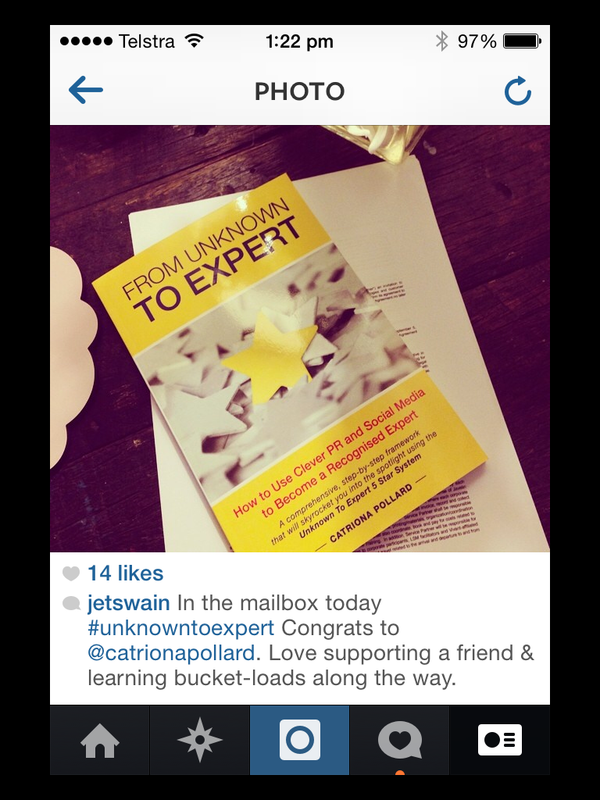 A simply written book with positive and empowering language on how to go from unknown to expert. As a small business owner trying to raise my profile online, this book has proved invaluable in deciding where to start which is always the most difficult point! I feel like I have my own publicist. 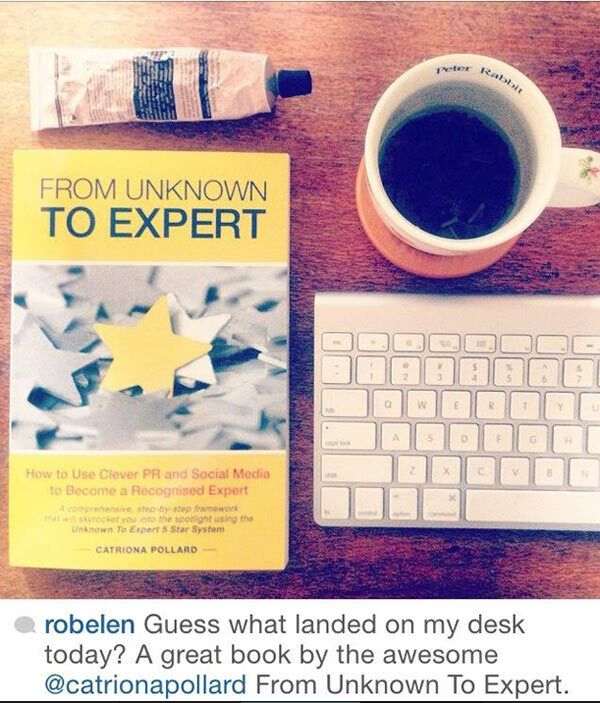 A must read for anyone who's trying to get PR for their business and position themselves as an expert! 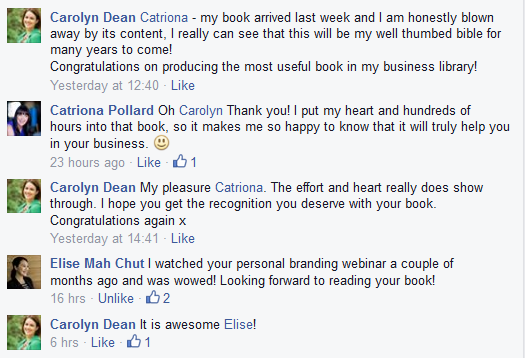 Even Introverts Can Step Into the Spotlight - Catriona shows us how! When I heard that Catriona Pollard had written this book, I had to buy it! Catriona has steadily and consistently built her reputation in Australia and I had to find out how. As a fellow introvert, I loved how she gave her steps to overcoming the fear of speaking in public and of 'stepping into the spotlight' Her down to earth advice, coupled with her mindset tips make this book even more valuable. The 5 step system is easy to understand and I love that she gives action tips - after all, nothing will change unless action happens! No matter how small your business is or how 'unknown' you feel you are, this book will help guide you! I love it - it's so easy to read and breaks down the key steps for establishing expertise in any industry. I'm already implementing the great ideas and looking forward to even more growth in my business as a result. Thanks again. A must have in your business bookcase. Having followed Catriona for some time, I was excited to see that she had published a to-do book based on her path. I wasn't disappointed! Full of information & helpful tips this book is a blueprint for anyone just starting out on the path of social media. I thoroughly recommend it, and Catriona! Those who can do and thank goodness she's told us how we can too! Catriona walks her talk. 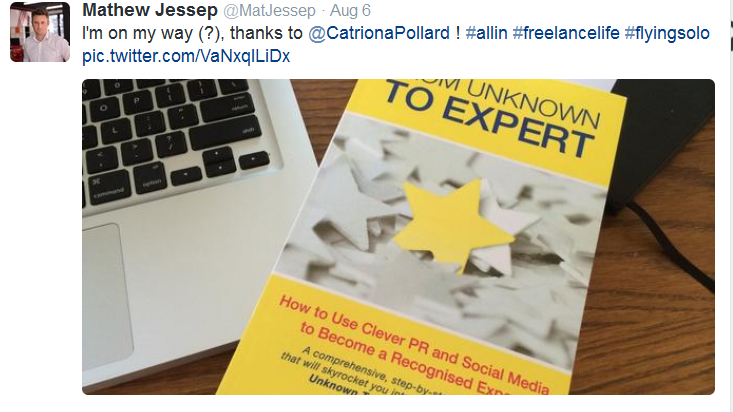 I have personally witnessed Catriona becoming an expert this during the past couple of years. It shows not just the power of intention followed by action but that this system works. 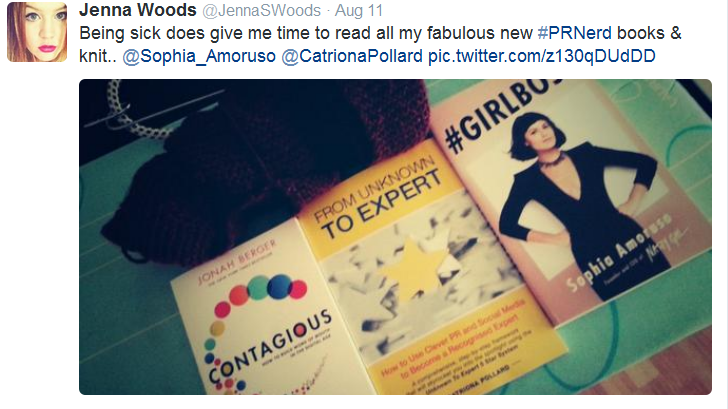 Catriona knows PR and embodies it. I was in NY recently and overheard a very hip 25 year old telling a girl not to go to Business school because she could learn more by doing than studying. He gave examples of his own journey. That's exactly what this book does. It creates a road map and if you follow it taking a bit of time to breathe at the stop lights you'll be well on your way. Thank you Catriona for documenting this. I have been reading, making notes and most importantly doing. I have already secured 3 workshops in Europe in the last 2 weeks and every time I glance more people are following me on SM. My intention for this year was to grow my profile to get my jewels, my yoga app out there and following this book I am thrilled to say its working. Practical information - ready to implement now I loved this book. I've been following Catriona's blog for a few years, and it's brilliant to have all her wisdom condensed in to a book. I've been sharing lots of tips with my husband that he can implement in his business, and even he has commented on how practical it is. 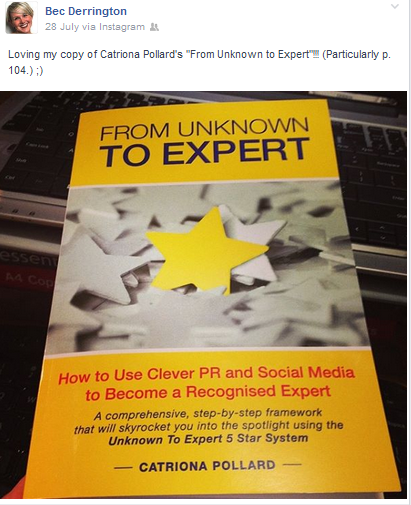 A business handbook that is sure to bring 'real' results: I competed a one day workshop with Catriona a few years ago which was fantastic and helped me get PR exposure in some great Australian newspapers. So I was excited to see she had released a book because this is a topic you need to keep revisiting and thinking about - its not a one-off activity. Reading the book has been like being able to pick Catriona's brain and benefit from her wealth of expertise and insight. Such a practical, focused book that is going to be my go-to staple for a long time. Highly recommended. 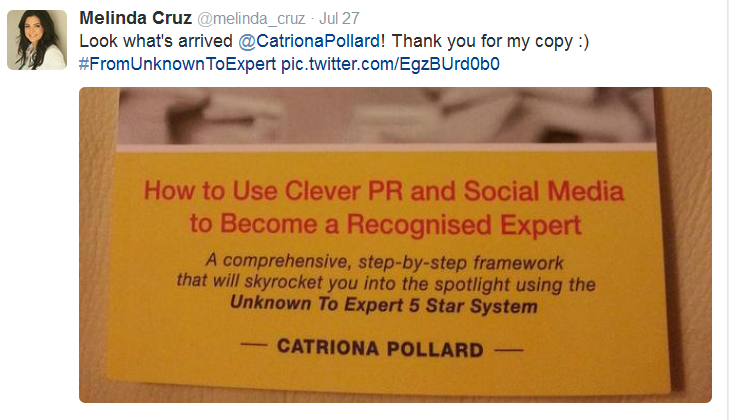 A first class step by step guide to becoming an ...A first class step by step guide to becoming an expert in PR. The steps and strategies are very clearly set out and reinforced with practical examples and relevant tips. It clearly demonstrates the author's claim to be an 'expert' and provides all readers with the opportunity to do so as well. Truly empowering. I'm so glad I did because I have learnt so much from ...I heard Catriona speak at a workshop and decided to buy the book based on her presentation. I'm so glad I did because I have learnt so much from not only her book but also from the free resources available on the website. There was so much value there that I also bought her course! I can highly recommend this book for anyone trying to learn how to stand out in their field. 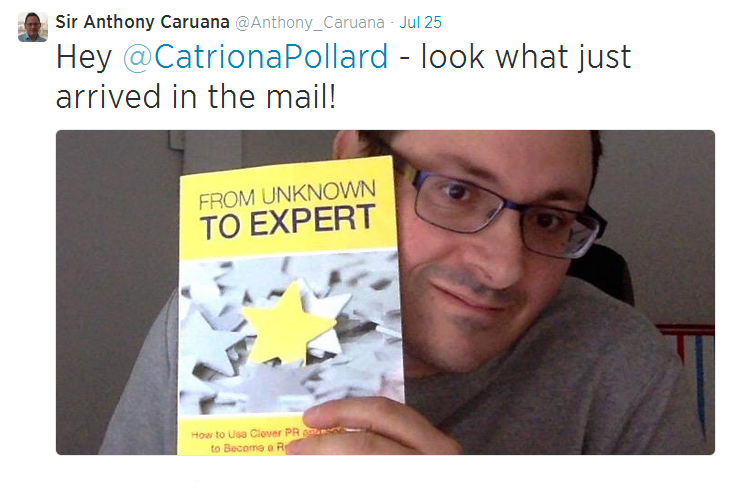 Direct, clear and to the point - From Unknown to Expert is must have for any entrepreneur's library, There are lots of business books out there that tell you ABOUT doing something.But From Unknown to Expert is not one of those books. It's way better because it tells you exactly HOW to achieve success. 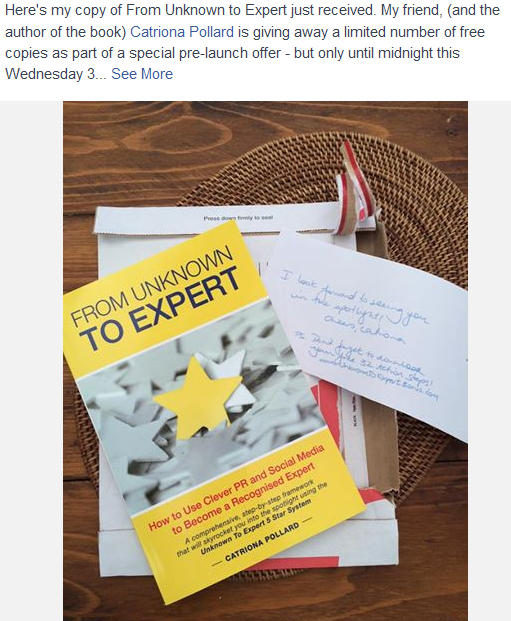 Catriona's experiences, good and bad, come together to provide insight and direction in establishing your credibility as an expert.Each chapter solves specific problems with simple advice. There's no jargon and the reader is treated with respect. I was lucky enough to receive a copy from Catriona but I'm buying a Kindle copy so I can have the book with me all the time. Good Job Catriona. This book was just exactly what I needed to read at this point in time. For anyone in business who doesn't get social media - it is a perfect intro and covers all bases. It's also great for women lacking the confidence to call themselves an "expert". I'm not sure I still feel OK calling myself an expert, even after reading the book, but the book certainly gave me a big push in the right direction. A book you'll refer to again and again. 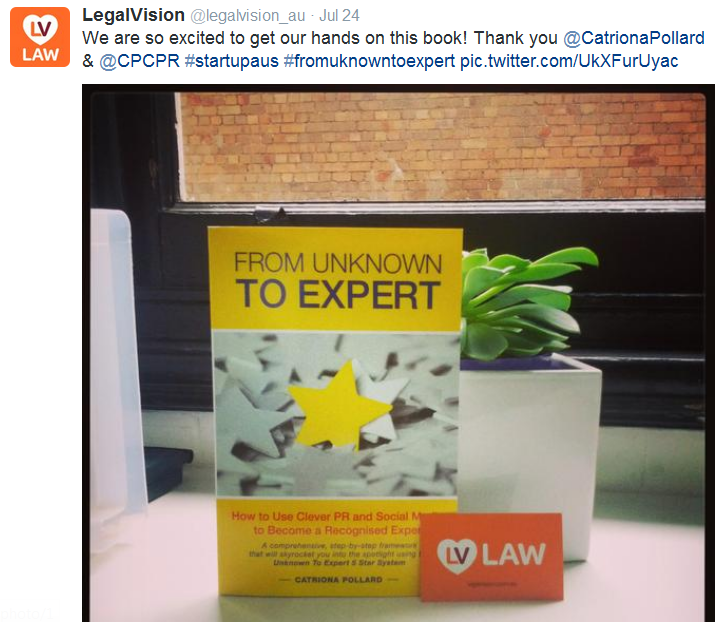 Easy to read and packed with practical ideas on how to grow your expert status. You probably won't be able to apply everything straight away and it doesn't matter - the book is so well organised that it's easy to go back to the part you need at any time. 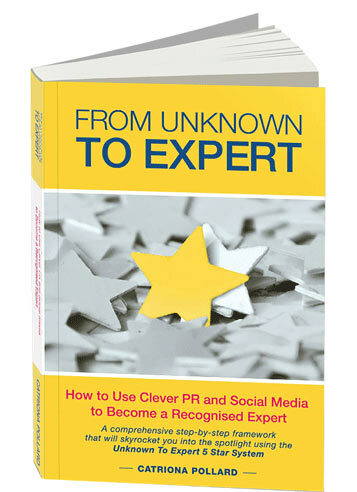 Raise your profile and shine: I found ‘From Unknown to Expert’ a straightforward, useful and warm guide to building profile and sharing expertise. Three things stood out for me: Catriona’s generosity in sharing her considerable PR experience, the practical steps that you can genuinely implement yourself, and the integrity - because Catriona has walked this path herself. I’m very glad I read it.